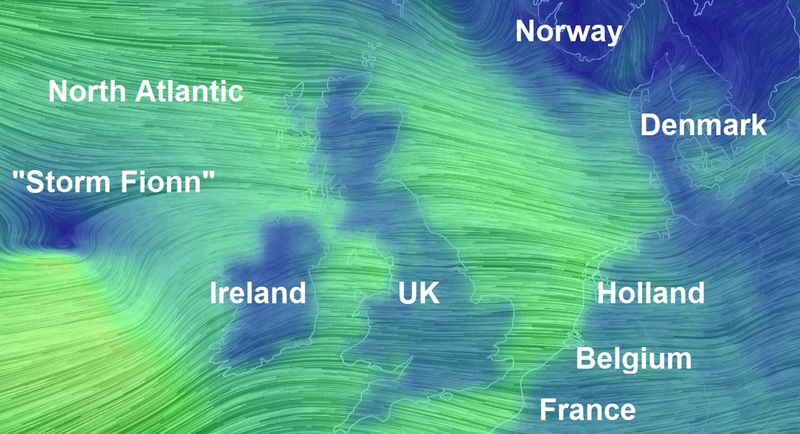 Earthwindmap "Storm Fionn" the sixth named storm of the season has arrived and is battering parts of Ireland and the UK with galeforce winds and sleeting rain and snow likely to cause chaos through Wednesday. According to AccuWeather coastal regions of southern and western Ireland will endure the strongest winds with frequent gusts of 100 km/h (62 mph) and occasional gusts as high as 120 km/h (75 mph). Hundreds of stranded drivers have spent a freezing night in their cars as thundersnow caused havoc over Britain. According to The Daily Mail, mountain rescue teams were drafted in to check on drivers stuck in their vehicles on the M74 in Lanarkshire after heavy snow showers struck the country, with up to 15in (39cm) of the white stuff hitting Dumfries and Galloway. Snowstorms are set to batter Britain with several parts of the country already experiencing weather and travel chaos. More than a foot of snow was recorded in Eskdalemuir in Dumfries, Glenanne in Co Armagh had 23cm, while Tulloch Bridge in Inverness saw 21cm of snow overnight with temperatures as low as -4C. The damaging windstorm is expected to move on the east to target areas from northern France into Belgium, Netherlands, Luxembourg and Germany from early Thursday morning into Thursday night. Northern France will be the first area to be impacted by the windstorm early Thursday morning after it slams the British Isles Wednesday night. My brother in law took this picture on Tuesday night of Oslo International as he arrived two hours late after being delayed at Schiphol Amsterdam.